Sir do you suggest a breakout from 9240 or a correction to sub 9000 levels is still a possibility . Break out of the Neutral Triangle which ended at 7983 on Dec 26, gave a post formation target of 9500. 9310 is 98% of 9500. In other words. 9300 is within 2% tolerance of 9500.So the uptrend is maturing fast and a reaction is likely. It could take Nifty below 9000. This does not alter the long term bull in any way. If anything a decline will only add fuel to the bull fire. Remember, this is a liquidity bull, not a growth bull. So strange events can still happen. And we have not even entered the euphoric phase yet! Alas, I do not possess such capability! In my 27 years of trading, I was not hampered by not knowing the precise date of market turn!. Such predictions is largely an Ego Trip. Just know the general time zone of reversal and use technical indicators to guide you when the turn happens. The market is supreme. I have seen markets moving exactly in the oppossite direction of astro predictions many times. Agreed Micky. Astrology or Technicals are never infallible. Let us trade along the trend and wait for the market to tell us when it is ready to fall.No point in forecasting prices so far out. NATS Long Term Astro view 2016-2017 Nov 27 2016 to January 08, 2017. You could see that both the significant bottom and the rise afterwards had been forecast and periodically levels were given. It is upto you that these information are put to use. It could form another major top beyond 9119 by May 2017. Which means, markets could come down to 7600 levels, and after December 13 should start moving up, have a reaction around Christmas and then move up further. “Sometimes it is amazing how the entire market breaks down its complex inner signals into its binary mode of Fear and Greed. When Fear increases over Greed market falls and vice versa. “We are entering into a very hectic period astrologically. We see that the Jupiter Pluto square was very close to the day of up turn in Nifty It`s pair aspect is the Uranus Jupiter opposition on December 26. Immediately Sun Uranus trine is on hand on December 12. Contrary to our expectations Sun Saturn square rose into the conjunction. Probably because of the Uranus factor close by. Dec 26 looks explosive, because apart from Jupiter opposing Uranus, Saturn also trines Uranus. In addition Mars conjuncts Ketu and opposes Rahu. Within 3 days on Dec 29, Uranus turns direct. When a planet changes direction, its energy becomes very intense. Such a Uranus is connected to both Saturn and Jupiter. Something big is on the cards. Uranus likes it big and this time it is assisted by Mars and the nodes as well”. Since the western equity markets will have only thin volumes from this week, till the year end, we may expect major market turns because of these powerful formations to happen in the new Year, in the first week of January 2017. Maybe Mercury retro could lead to a market fall and markets could recover from the middle of the retro period which is from 19 Dec to 09 Jan 2017 It appears that the markets could fall again after the Mercury retro period because of the involvement of Uranus with the other giants, Jupiter and Saturn. Conclusion: Mercury retro could cause a fall. Any rise which happens after the fall also is to cautious of. A bigger fall awaits all markets in Jan 2017. (Dow did fall lower than Dec 30 on Jan 23 2017. 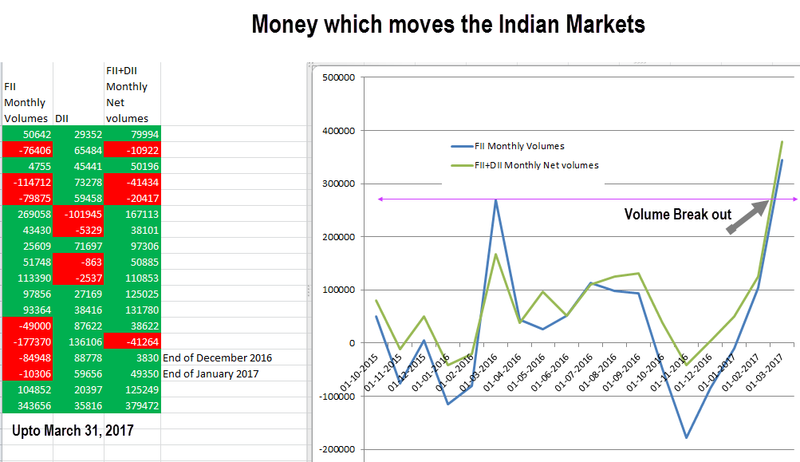 From 13 Jan 2017 to 23 Jan 2017, Nifty reacted from 8461 to 8327, forming a higher bottom than 7893 of Dec 2016). Then we are in the middle of a Jupiter Uranus opposition and a Saturn Uranus trine. So the Uranus energy can pull the market up, maybe more than we expect before a turn around. Also by the weekend, Sun conjuncts Pluto This coincides with Mercury direct. So even though retro station ends on January 09, let us look for a market interim top next week. Astrowise, we expect this uptrend to continue in this week. How would the markets be from an astro point of view? We expect the bull phase which had begun in February 2016, to resume this year and possibly make an All time high. We also expect significant declining phases to occur this year. So our over all expectation is a two way market with heavy volatility. Long term trends are better understood by the effect of Long term planets. We had covered Saturn Neptune Square, in our post of October 10, 2016. Accordingly we expected a significant top to form sometime in May 2017. In the period 2017 to 2020, Saturn opposes Rahu in 2019, when Rahu is in Gemini. So 2017 should at least be a good year for equities. So in the near term there could be a decline. It may lead to a higher bottom. We do not expect a decline below 7893 Earlier we were expecting 7700 levels, but markets in their wisdom decided to form a low at 7893. All quotes are from the corresponding blog posts.